A man whose great-great grandfather was killed and eaten by cannibals has taken part in a unique reconciliation event in the South Pacific. In the 1830s, the Reverend John Williams was the most famous missionary of the age. 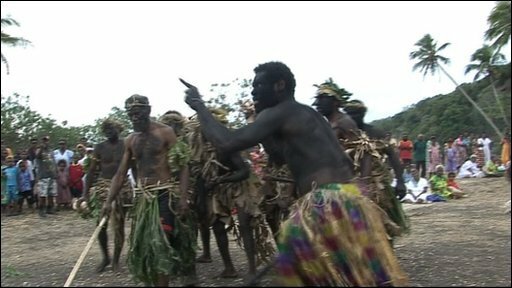 Now, 170 years after his murder the descendants of those responsible invited his family to Erromango, part of the island nation of Vanuatu. Charles Milner-Williams, of Hampshire, was among those who made the journey. The 65-year-old joined 17 members of his family from around the world to travel to the small island. The reconciliation event, marking the 170th anniversary of the death of Mr Williams and his fellow missionary James Harris, has been long awaited. 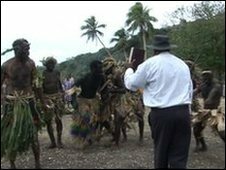 The President of Vanuatu, Iolo Johnson Abbil, told the BBC it was a very important event for the country as a whole, where Christianity is now strong. He said some people from Erromango feel the island has been under a kind of "curse" because of killing missionaries. "Since we claim to be a Christian country it is very important that we have a reconciliation like this," he said. "Erromango needs it very much. People always look upon them that they killed a missionary, they think that it has sort of a curse on Erromango and that's why it's very important for them to have this reconciliation." 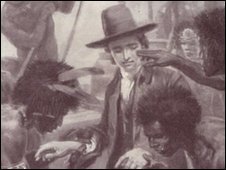 When he was 20 years old, Mr Williams set out for the south seas in 1816 under the auspices of the London Missionary Society. 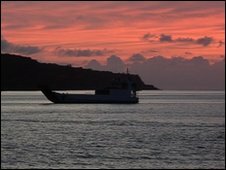 For the next 20 years he sailed between Polynesian islands, successfully converting many people to Christianity. But he was not welcomed everywhere. In 1839, on what was to be his final voyage, he travelled to the islands of the New Hebrides - more than 1,000 miles east of Australia. Days before, European sandalwood traders had killed people on the island of Erromango. When both men stepped ashore at Dillons Bay the reaction was hostile. Both were attacked and killed. Mr Milner-Williams said eye-witness accounts from the captain of the missionary ship "Camden" describe what happened. He said: "Harris, who was the furthest inland, was clubbed down and killed. "John Williams turned and ran towards the sea. They caught up with him on the sea shore. They clubbed him and shot him with arrows and he died there in the shallows. "It was a Royal Navy ship that went back to the island. The islanders then said that yes they had killed and eaten both Harris and Williams." Member of the Vanuatuan parliament and anthropologist Ralph Regenvanu helped to bring about the reconciliation. He said it was "very important" for the people of Erromango. "They've had a psychological guilt or complex about the fact there may be some kind of curse on the island because of the killing of the missionary John Williams here, all those years ago," he said. "Reconciliation is very much part of our culture. Saying sorry is part of it but all reconciliation ceremonies require something from each side, there's always that element of exchange. "Cannibalism, contrary to what a lot of people think, was traditionally a very ritualistic and sacred practice. "It was not something like you know, have your neighbour for lunch. "It was practised in a very ritualistic way and was considered to be a very sacred activity. "A lot of the time it was a way of vanquishing a threat, absorbing the power of an enemy. "John Williams may have been eaten because he represented this threat, this incursion of European civilisation that was coming into Erromango at that time." During a day of ceremonies in Erromango, the community re-enacted the killings. Dozens of descendants of those responsible for the deaths queued up to ask the Williams family for forgiveness. "I thought I would be dispassionate after 170 years but the raw emotion, the genuine contrition, the heart-rending sorrow has been hugely moving," added Mr Milner-Williams. The connection between the Williams family and Erromango will now continue. They have agreed to take on responsibility for the education of a seven-year-old girl who was ceremonially handed over to them in exchange for the loss of John Williams. Dillons Bay, where the missionaries were killed, has now been renamed Williams Bay as a mark of respect and reconciliation. Feature appears on Inside Out, BBC1, 1930 GMT, Monday, 7 December.